Spectacular views of the sea. 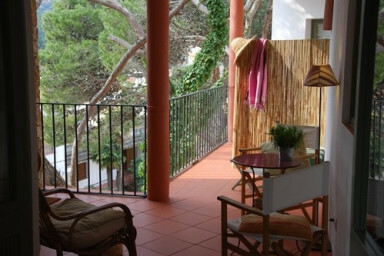 It has a small terrace outside the entrance of the apartment and it is 50 m from the beach. On the 2nd floor of the building, just 50 meters from the beach. Spectacular views of the sea and the beach. It has a small terrace outside the entrance of the apartment, a queen bedroom and a living room with a dining area where there is a sofa bed. The apartment is fully equipped with everything you could need for a comfortable stay. It has a terrace for private use and a garden that is shared with the other apartments of the building. This apartment has sea views from the windows and it has much light and fresh air. The kitchen is integrated in the dining area, with the living room next to it. The terrace is at the entrance front of the apartment, which is on the second floor of a 3 floor building. The apartment has a queen size bedroom with a very large closet and a window that faces the private terrace. The sofa-bed located in the living room is suitable for two people to sleep as it is queen sized. If you are planning to come by car, there is usually parking spots in the same street where the apartment's building is, to which you accede through the old stone stairway. In case you can't find any empty spot, there is an other paking place on the main street in Tamariu: La Riera, which 3 minutes walking from the apartment. Tamariu is 126 kilometers away from Barcelona and is one of the 3 beaches of Palafrugell along with Llafranc and Calella. Communitary use of the garden. Tamariu is an old fishing village with a central beach and two small beaches on each edge. It's one of the three beaches of Palafrugell's town, together with Calella and Llafranc. The boulevard along the central beach is full of restaurants and small businesses. In the village there are two supermarkets, a couple of bakery shops and places where you can get food to take away as home made "pices of pizza". You can rent kayaks at the beach to go on tours along the coast and get into the caves near Tamariu, which are worth seeing. The "Camí de Ronda", which is an old woody path along the cliffs of the entire Costa Brava coastline, drives you to places and quiet gorgeous small coves to go spend a day out. The beach of Tamariu also offers the option to rent boats or "zodiacs" and there are some diving schools such as the Stolly's Diving School, among other activities. The coastal mountains surrounding Tamariu are also worth seeing, so going out on an excursion is a good alternative to beach days, great to do with bikes! At night, there are diverse pubs and bars where the vacationists gather to have a drink and chat with background music and nice ambience. Location was excellent and cleanliness of apartment was also great. It is a very well presented apartment which was perfect for what we needed. It would have been nice if a few more basics were provided with the apartment, i.e. kettle, coffee for the coffee machine. I noticed that the apartment next door had these things but ours did not. However, overall our stay was lovely! Vue superbe, logement très agréable, à louer sans hésiter! Lovely apartment with great views. Goed appartement vlakbij strand, restaurants en winkels. Appartement conforme à l'annonce, des espaces agréables, bien équipé et un emplacement proche du port tout en restant en retrait de l'agitation des bars et du port. Quelques inconvénients : literie molle, mauvaise isolation acoustique, parking dans la rue peu pratique. Considero que faltaba limpieza en el apartamento y habia mucha humedad y hongos en la ducha. +Wir haben einen angenehmen Familienurlaub hier verbracht. +Der Vermieter ist sehr bemüht und ist auf unsere Extra Wünsche eingegangen ( wir hätten das Appartement nach einer Woche für die zweite Woche wechseln müssen u der Vermieter hat sich mit unserem Nachfolger in Verbindung gesetzt u uns somit ermöglicht im Appartement zu bleiben). Somit hat er uns auch nur einmal Endreinigung berechnet. +Appartement ist mit Ikea Möbeln zweckmäßig, aber mit Charme eingerichtet, einige Küchenutensilien könnte man noch aufstocken +/-Appartement ist nur über eine Treppe mit vielen Stufen zu erreichen, ebenso der Strand. - pro Wohnung gibt es nur einen Satz Schlüssel, somit ist es immer etwas schwierig mehrere Familienmitglieder zu koordinieren. Wir werden aber mit Sicherheit wiederkommen, um wieder einen schönen Urlaub hier zu verbringen..